Easy Rack sells two types of traffic barricades designed for specific traffic control purposes in specific commercial and public environments. Traffic barricades are normally orange in color, which makes them almost impossible for motorists to miss. However, in some environments where appearance really matters, barricades can be ordered in granite color. Poly cade barricades look like miniature “walls” that form obvious and unmistakable vertical barriers to people and vehicles. They can be used as singular units, or they can be arranged in tandem to create an artificial wall spanning a roadway, runway, or entire parking lot. 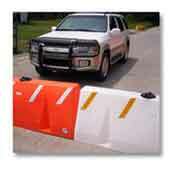 Big barrier traffic barricades are basically barrels made out of special materials that can be filled with either sand, gravel, or even water to make them heavy enough to withstand the impact of a vehicle and stop it in its tracks, but also soft enough not to cause excessive damage to the vehicle at the point of collision. 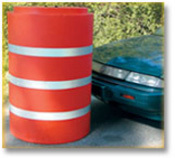 Standard orange traffic barricades are used in mostly public and industrial spaces. Their most common use is in any public area where restricted access is needed to ensure motorist safety. We often see them in parking lots, for example, where construction, repair, or lighting pole installation is underway. Another important use for them is to block access to areas where hazardous materials are stored. Chemical companies almost always use some sort of traffic barricade to prevent people and equipment from being harmed or damaged by exposure to dangerous materials or industrial waste. Certain forms of machinery in large factories can also be potentially dangerous if untrained employees, clients, or visitors to the factory get to close. Traffic barricades clearly designate where the safe areas are and where restricted access begins. Amusement parks sometimes use orange traffic barricades to keep underage children away from areas intended only for adolescents and adults. They also use them to limit access of golf carts and other small motor vehicles typically used to transport employees and customers around the park. In our world of material handling, some of our biggest poly cade traffic barricade customers are construction companies. They often buy these products in large quantities and literally use them to map out a construction site, showing where public and restricted areas are located and limiting access to these places for only certain levels of personnel and types of vehicles. All traffic barricades are rust proof and UV resistant, making them both rain and sun proof as much as current technology permits. Like we mentioned earlier, both poly cade barricades and big barrier traffic control barrels can be ordered in a number of different colors. Orange barrels are made with additional reflective stripes that catch and mirror sunlight. However, this can be very unattractive in formal settings like the front of city hall buildings, major airports, exclusive neighborhoods, large universities, and corporate headquarters. 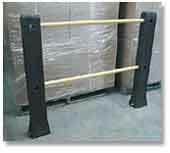 If necessary, Easy Rack can supply these barricades in granite color, yellow, or white. Our smaller poly cade traffic barriers weigh only 70 lbs. The larger barrel-style traffic barriers can weigh over 3,000 pounds when filled with sand. Easy Rack experts will help you select the style, size, and filler content of your barricade most appropriate to your location and application. Call now for a free quote and more information.